In order to accurately estimate nutrient requirements of livestock, it is desirable to know the composition of tissue accreted or lost. Much less information on body composition of goats is available relative to that for other ruminant species such as cattle and sheep. The cost and labor associated with harvest and the determination of chemical composition of the whole body or carcass and noncarcass components are high. Furthermore, such measures are terminal, necessitating assumptions of similar composition of other animals at later times in serial slaughter experiments. 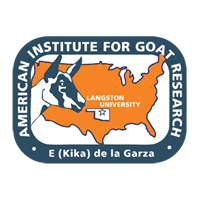 Therefore, there is need for simple, inexpensive and non-terminal means of assessing body composition of goats. In this regard, growing Spanish wethers and doelings (31; initial age of 3.5 mo) consumed ad libitum diets differing in quality continuously for 18 wk or with an increase in quality after 9 wk. Urea space (US), shrunk body weight (SBW) and chemical composition of the whole body were determined at the beginning, middle and end of the experiment. In addition, at the beginning of the experiment the same determinations were made with two yearling Boer × Spanish doelings that had consumed a high quality diet ad libitum for 12 wk. SBW accounted for most variation in body composition of growing goats of this experiment. Nonetheless, small improvements in explained variability resulted from inclusion of US in equations for water and fat. Equations yielding best prediction of body composition of weaned goats were: water (kg) = 1.274 + (0.1546 × US, kg) + (0.5782 × SBW, kg) - (0.0043 × SBW2, kg); fat (kg) = -0.921 - (0.1520 × US, kg) + (0.1564 × SBW, kg) + (0.0064 × SBW2, kg); protein (% water) = 34.696 - (0.1175 × predicted water, %); and ash (% water) = 0.0448 × predicted water, %. However, utility of such equations at present may primarily be for within experiment treatment comparisons or for assessing changes in composition.